The soaring temperatures have something to do with attars flying off the shelves in the Old City might be something hard to believe. But, the fact that attars are specifically designed not only for people of various age groups but also for various seasons justifies its increased sale in and around the Old City of Hyderabad. Not many know that the summer-specific attars, when applied to the body, not only makes one smell nice but also cools down the body. Kashish, for instance, is one such summer-specific attar. 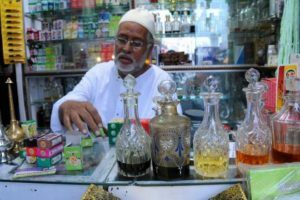 Mohammed Ghouse, an attar shop owner near the Mecca Masjid, says, “The sale of Kashish, made specifically for summers, has gone up in the recent days. It is a natural perfume made from flowers. 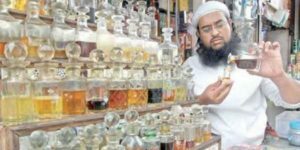 Mohammed Imran Khan, another attar shop owner near the Masjid, however prefers perfume made of khas, or what we commonly call vetiver, over Kashish. “Khas attars are so potent that if you apply it during winters, you are sure to get sick,” Khan says. Abdullah Jafer, co-owner of Shah Perfumes and Gems established in 1937, reiterates the same and says that most people, nowadays, are buying flower-based or khas perfumes, which have a cooling effect. The sale, however, has not been the same for everyone in the industry which has a stiff competition from branded deodrants and sprays. Rows and rows of bottles of many-hues and shapes adorn the shelves of the shop owned by Puranadas Ranchhoddas at Gulzar Houz near Charminar of Hyderabad. Often, visitors find it hard to resist the myriad colours, as they walk-into the shop to explore. Step inside the store and you will be greeted with the fresh fragrance of flowers. The store is one among several such outlets at Gulzar Houz retailing the famous Hyderabad ‘attar’, oil extracted from botanical sources, especially flowers and herbs. “Despite international perfumes flooding the market, demand for attar is always there. 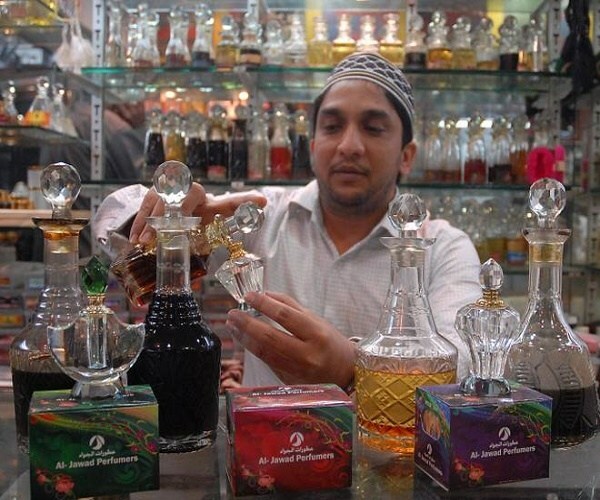 Irrespective of caste and creed, people buy various brands of attar,” says Ashwini Kumar, of Puranadas Ranchhoddas store. There are many ways of making attar but chief among them is the process of distillation and blending. Most of the attar makers have distillation units where flower petals are distilled at low heat and pressure to prepare the concentration. Natural attar is usually made through the process of distillation monitored by experienced master distiller. During the distillation process, the extracts from boiled flowers are mixed with sandalwood oil. “Depending on the quantity required, the process takes days at a stretch. Usually, it is spread over a week and often it takes even a fortnight,” says SA Gaffar, attar seller and manufacturer at Mahboob Chowk. There are over 50 attar stalls in the city and the prominent ones are those located between the stretch between Charminar and Madina building. Locals and tourists make a beeline to the attar shops to purchase various brands of perfumes packed in beautiful glass bottles. ALSO READ: Despite 'Stringent Laws' And 'Hawk Eye', Why 'Human Traffickers' Go 'Scot-Free' In Telangana? 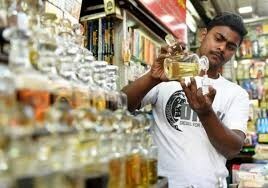 Depending on the quality and variety, a 10 ml bottle may cost anywhere between Rs 100 and Rs 1,000. Natural perfumes cost more as they contain sandalwood oil which is expensive. The synthetic or aromatic attar prepared using chemicals are less expensive. All through the year, there is perennial demand for attar made out of jasmine, rose, musk, mint, lime blossoms. “In tune with changing times, new brands have been introduced by shop keepers for youngsters, especially those who want a substitute for foreign perfumes,” says Zaffar an attar seller at Gulzar Houz. 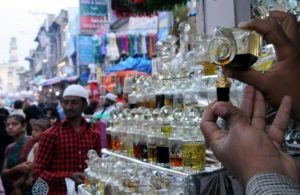 The demand for attar has come down in old city but the attar outlets continue to remain top attractions for foreign tourists and those from other areas of the city. Many purchase them as souvenirs for the purpose of gifting. Previous articleWhy The Separated CPI And CPM Parties Joined Together After 20 Years In Telangana?